The Series WWDP Wet-to-Wet Differential Pressure Transmitter offers everything in one package by having 30 field selectable variations in just 3 models. The WWDP provides field selectable unidirectional and bidirectional pressure ranges, configurable 0-5, 1-5, 0-10 VDC, and 4 to 20 mA output. It also provides an auto-zero capability. The field selectable port swap feature eliminates costly replumbing if the unit is improperly installed or if the transmitter is simply replaced. 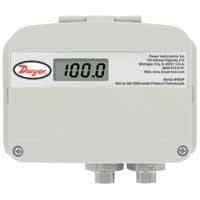 An optional LCD display is available for on-sight indication of line and differential pressure. The all cast aluminum housing is rated NEMA 4 (IP66). These features make the WWDP transmitter an ideal instrument for measuring the flow of various liquids and gases, pressure drop across filters, measurement of liquid level or pressurized vessels, and for use in energy management and process control systems. Service: Gases or liquids compatible with 17-4 PH stainless steel. Accuracy: All pressure ranges have ±1% full scale accuracy except the lowest selectable range of each unit is ±2% full scale. Operating temperature range: -4 to 185°F (-20 to 85°C). Pressure Limits: Max working pressure: WWDP-1: 50 psi; WWDP-2: 100 psi; WWDP-3: 250 psi; Proof pressure: 2.2X of full scale; Burst pressure: 40X of full scale. Thermal Effect: 2% FS/100°F (50°C) includes zero and span. Power Requirements: 12 to 30 VDC/18 to 28 VAC (Reverse Excitation Protected). NOTE: 4-20 mA output cannot be powered with AC voltage. Output Signal: Selectable 0-5, 0-10 and 1-5 VDC; 4 to 20 mA. Zero & Span: Digital "re" zero button (should be used when changing ranges). Span can be adjusted by changing between field selectable ranges. Response Time: 1 to 5 sec (selectable).Loop Resistance:1000 ohms. Current Consumption: VDC power: 0-5, 1-5 VDC output 4 mA (typ); 0-10 VDC output 5 mA (typ); 4-20 mA output 20 mA max. Current consumption will equal the transmitter output in current mode. VAC power: 0-5, 1-5, 0-10 VDC output 40 mA (typ). Electrical Connections: 1/2" conduit.Process Connections:1/8" female NPT internal. Enclosure Rating: Designed to meet NEMA 4 (IP66). Mounting Orientation: Vertical; mount the pressure ports down (keeps debris from building up inside the pressure port). Weight: 1.5 lb (680.4 g). Differential pressure transmitter, selectable 5, 10, 25, 50 psid, 50 psi max. working pressure, with LCD. Differential pressure transmitter, selectable 10, 20, 50, 100 psid, 100 psi max. working pressure, with LCD. Differential pressure transmitter, selectable 25, 50, 125, 250 psid, 250 psi max. working pressure, with LCD.